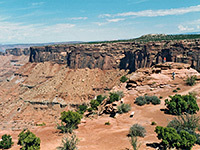 A vast wilderness east and south of Canyonlands National Park is contained within the Canyon Rims Recreation Area, which as its name suggests features many canyons, cliffs, mesas and eroded red rock formations, though also a lot of flat, rather featureless grassy plains. Most lies to the east, starting a little south of Moab, and extends from the Colorado River opposite Dead Horse Point across to US 191, and down to the border with the Manti La Sal National Forest at the foothills of the Abajo Mountains. This section has three long canyons - Kane Springs, Harts Draw, and Indian Creek, along which runs road UT 211 past Newspaper Rock State Park into the Needles District of Canyonlands NP - and also a great escarpment formed by high red Wingate sandstone cliffs that mark the boundary between the Colorado River valley and the plateau beyond (Hatch Point and Harts Point). The southern part stretches from the edge of the Needles District southwest towards White Canyon near Lake Powell, and contains several deep, branched tributaries of the Colorado River, principally Bodie Canyon, Gypsum Canyon and parts of Dark Canyon. All this region was briefly within Bears Ears National Monument, but has since been excluded. 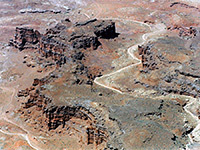 This road leaves US 191 to the west and ends after 21 miles at the rim of a high promontory that has wonderful views over the Needles and Confluence areas of Canyonlands National Park, crossing a flat, treeless plateau en route with no hint of the dramatic vista ahead until right near the cliff edge. At the overlook the land drops away for 270° and the overall scene is as good as the Grand View Point in the Island in the Sky region, perhaps better as there are usually no other visitors to disturb the tranquillity. Camping may be allowed at roads end, which has a parking area and picnic shelters, though if not there are a few dirt tracks a short distance to the south, also ending at the rim, that allow camping or overnight parking just a few meters from the cliff edge. Impressive as the views are, the scene is difficult to photograph as there are no distinctive features in the middle ground - beyond the near cliffs is a large flattish expanse of small ravines and mesas, with higher peaks in the far distance, including the Henry Mountains and the Abajo Range. The Canyon Rims Recreation Area is administered by the BLM so activities are relatively unrestricted, with free camping, and a large network of roads allows for nearly endless hiking and exploring, though many require a 4WD vehicle. In the east, a good quality gravel track leaves the Needles Overlook Road 15 miles from US 191 and heads north across the Hatch Point plateau to the Anticline Overlook, another high viewpoint of the Colorado and its side canyons, as well as the folded strata around the Kane Springs Anticline. Less good side tracks branch off this route and give access to the upper ends of various canyons that cut into the edges of the plateau. 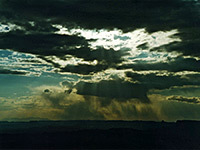 The southern section of the Recreation Area is less easily reached by road and require a long journey along rough tracks through the Manti La Sal National Forest.